Store and protect shipped products in these folding cartons, perfect as inner cartons and ideal for small items packaged in bulk. They have self locking tucks and can be assembled without glue or tape. Meets Military Specification PPP B-566. 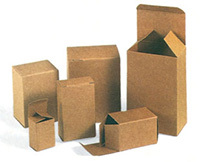 Cartons possess 60 pound bursting strength and a 0.024 bending chip. Sold per case. Price per case. Dimensions:1 1/2 x 1 1/4 x 2"
Dimensions:2 x 1 1/4 x 3"
Dimensions:2 x 2 x 3"
Dimensions:2 1/2 x 1 1/2 x 4"
Dimensions:3 x 2 1/2 x 4"
Dimensions:3 x 2 x 5"
Dimensions:4 x 3 x 5"
Dimensions:4 x 2 1/2 x 6"